This past Friday, I was wandering around Tsfat’s Artist Quarter when I happened upon the gallery of artist Miriam Mehadipur. 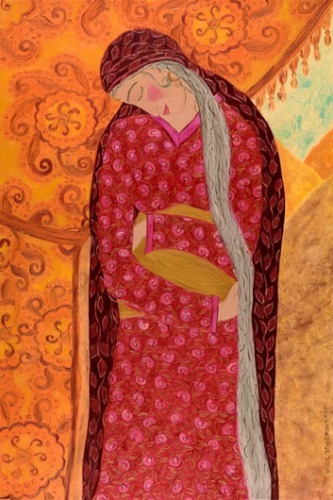 I was totally blown away by Mehadipur’s vivid and gorgeous paintings of Jewish women of the Bible, which I’ve shared below. Something nice occurred to me after I left Miriam’s gallery. 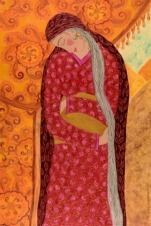 Miriam Mehadipur is herself a very beautiful and very spiritual woman, and I realized that her paintings of Sara, Rivka, Rachel, etc. are, in a way, self-portraits. But the real truth is, JewishMOMs, these are self-portraits of every single one of us. Scratch the surface of a Jewish woman, and you’ll find a matriarch. At our core this is how beautiful, how wise, how kind, how connected with Hashem each one of us is, or at least can be. This was my favorite painting of the whole bunch. I bought a print and am planning to hang it up above my computer. This is Sara Imenu, in her tent, embracing her pregnant belly with joy and expectation after so many decades of infertility. What do I love SO MUCH about this photo? I love that Sara Imenu's eyes are closed. Leah and Rachel Imenu. Isn't this painting so gorgeous? 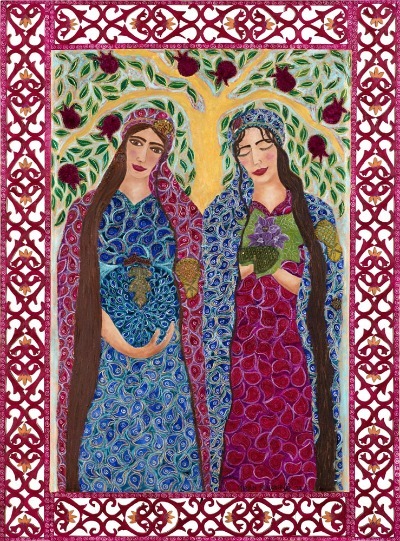 I love that Leah's eyes are closed and Rachel's eyes are open, which reminds me of something I once learned, that in the Kabbalah Leah embodies the world of thought, the hidden world, known as Alma di'itkasya and Rachel embodies the world of speech, the revealed world, known as Alma di'itgalya. I love that Rivka's face looks so kind and good. Miriam HaNeviah dancing with the women after the splitting of the Red Sea. Isn't she gorgeous? 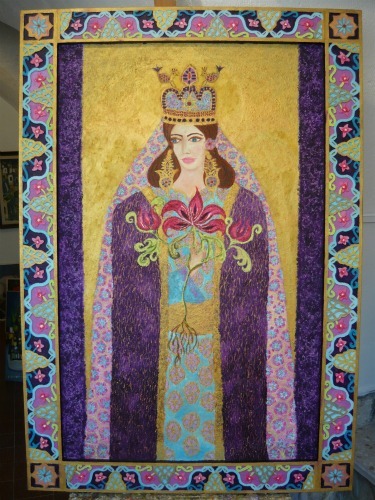 Queen Esther, how beautiful and royal she looks. This are stunning and uplifting at the same time! hi it could be that rochel has her eyes closed cuz she is holding purple flowers which might be the dudaim that she got from leah in exchange for leah spending the night with yakov (who i think conceived that night) and is now holding her pregnant belly? totally agree, that I think Leah is on the left with eyes open, Rachel holding the flowers and dreaming of the future. These are, indeed, stunning works of art! Thank you, Jenny, for sharing them with us Jewish women. Re:The picture of the two women. How do we know who is who? I think that the one to the right must surely be Leah. Why? B/cause she’s holding a bunch of flowers that hint at her saying: Forget-me-not! truth is, I don’t know. I also guessed. thought maybe the artist told you…. 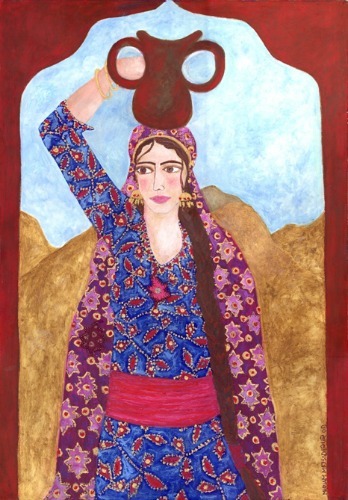 Do you recall the price of any of her paintings in Tsfat?